There it is. My memoir manuscript, printed and stacked on my desk. Actually, is it a manuscript or a draft? This book has been with me in so many different forms for so many years, just the fact of it being ready to send to three very generous friends who are going to be readers for me is huge. Yuge! 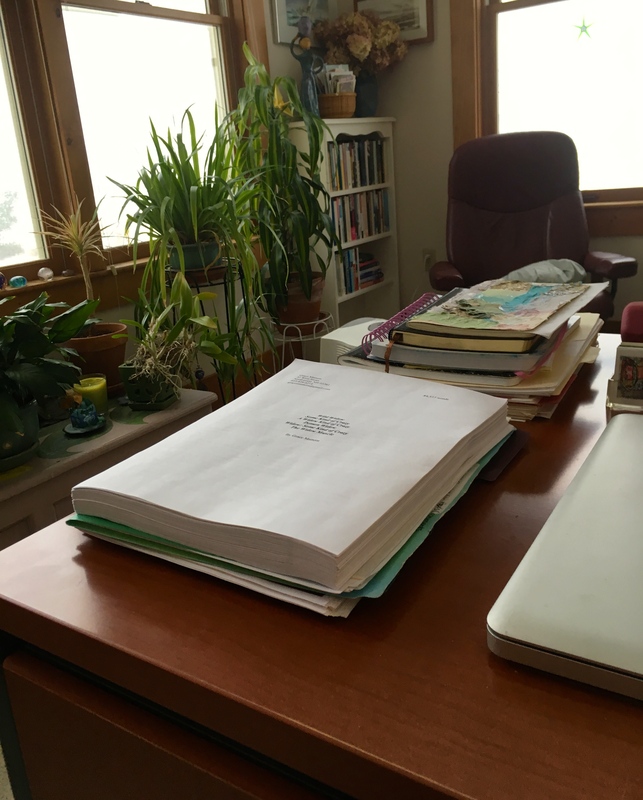 Is there a difference between a draft and a manuscript? This is what the New Oxford American Dictionary says: A manuscript is an author’s text that has not yet been published. Any piece of writing that you have not published in any way (but intend to) is a manuscript. A draft is the same as a manuscript, except that it insists on the unfinished state of the manuscript. I don’t insist on the unfinished state of this manuscript, but I’m certainly aware that it’s likely unfinished. The fact that the title page has six possible titles itself says it’s not finished. Sending it to readers to get an outside take on its shape and story and cohesion says it’s probably not finished. Whether what I’m sending out is a manuscript or a draft really doesn’t matter. What matters is that working on this memoir has occupied almost all of my writing time for the past year, a majority of my writing time for the past three years, and much of my writing head space for over nine years. So there’s a big question looming for me — what’s next? While I wait for feedback from my friends I’ll research agents to query and get back to sending out selections from the book to be published as essays in literary journals. But waking up thinking about a chapter that needs to be tweaked or obsessing over a key paragraph or realizing there’s another scene I need to write or one I need to take out or hunting gerunds to banish the passive voice as often as possible is over for now. The queries and submissions can be done as a secondary focus. What will my primary writing focus be? I’ve read enough writers on the writing process to know that finishing a book, or getting to the point where the book goes out into the world in some fashion, can be disorienting. When a piece of writing has “got you by the throat,” as a poet friend said to me last year, and then lets go, what do you do with all that breath that’s freed up? How do you decide where to dig to find the next book that’s going to take over? For now I’ll relish in this impressive pile of paper on my desk. Though it’s still only a manuscript and probably only a draft, it’s definitely a giant step further along the path to being a book. Big stuff!- Elizabeth writes a little about this in Big Magic and I think to some extent, My Inner Critic Is A Big Fat Jerk also addresses the TADA moment(s). What I keep hearing is just keep writing/painting/dancing…something is bound to come to the pen. I hope so for you because I like reading your perspective! I have not yet had a moment like this as I am honing my skills from amateur to intermediate…so I have so much to just straight up learn and very little TADA! Nice to hear from you. Yes, we need to keep creating and see what comes of it, and believe in it as an act of beauty and resistance. It’s hard to keep my head clear for it these days, but it’s essential. 🙂 life is great not painting enough but am working on it! Previous PostPrevious Don’t Be Fooled; Renew and Resist!